Bartholdi Park serves as a home landscape demonstration garden and showcases innovative plant combinations in a variety of styles and design themes. The U.S. Botanic Garden Administration Building and the Bartholdi Fountain are located in the park. Full details on Bartholdi Park and Fountain and other USBG destinations are at usbg.gov. The Cannon House Office Building, completed in 1908, is the oldest congressional office building as well as a significant example of the Beaux Arts style of architecture. After the Cannon Building opened in 1908 all members of the House of Representatives had an office for the first time in the nation's history. Before this time some committee chairmen used their committee room as an office, but most members worked at their desk in the House Chamber. Full details on the Cannon Building are at aoc.gov/house/cannon. 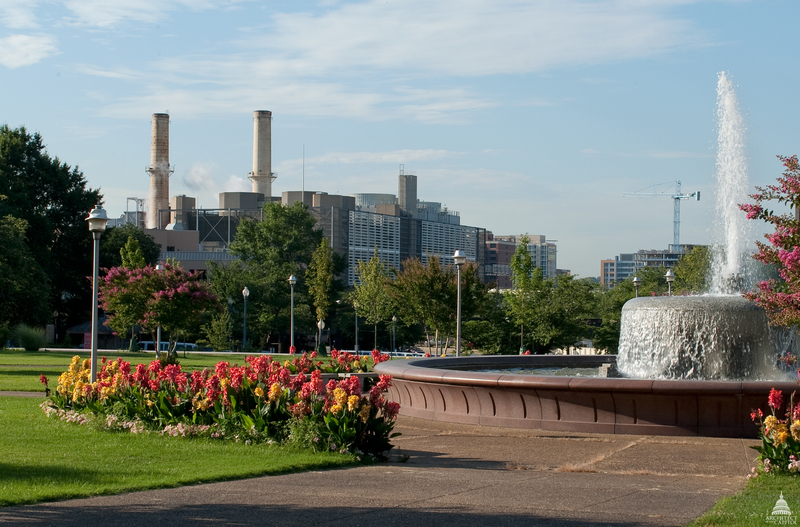 The Capitol Power Plant provides steam and chilled water used to heat and cool buildings throughout the U.S. Capitol campus. In December 1910, the plant started operations, generating steam and electricity for the U.S. Capitol Building. In 1951 it ceased generating electricity. The plant has been enlarged many times to keep up with expansion of congressional offices and corresponding increase in heating and cooling demands of the U.S. Capitol. Full details on the Capitol Power Plant are at aoc.gov/power-plant. The Capitol Reflecting Pool is located at the eastern end of the National Mall in Washington, DC. Six acres in size, it occupies over half of the area called Union Square. It is set into a plaza that includes, on the east, the Ulysses S. Grant memorial; to its west is a tree-dotted grassy area that extends to Third Streets, NW and SW.
Full details on the Capitol Reflecting Pool and other destinations on Capitol Grounds are at aoc.gov/capitol-grounds. The Dirksen Senate Office Building is the second of three office buildings constructed for the United States Senate. Full details on all Senate Office Buildings are at aoc.gov/senate. The Ford House Office Building was constructed in 1939 as Washington's first "General Federal Office Building," which was conceived as an economical, all-purpose facility to house New Deal workers. After being used by the FBI for years it was declared surplus property and acquired by Congress in 1975. Today it is occupied mainly by staff of various committees of the House of Representatives, the Congressional Budget Office, and the Architect of the Capitol. Full details on the Ford Building are at aoc.gov/house/ford. The tapered, cylindrical granite pedestal holds four over-life-size bronze figures, with the portrait statue of President James A. Garfield at the top and three allegorical figures representing different phases of his career below. Full details on the Garfield Monument and other destinations on Capitol Grounds are at aoc.gov/capitol-grounds. The Hart Senate Office Building is the third office structure designed and built to serve the United States Senate. Installed in 1986 in the building's atrium was the sculpture Mountains and Clouds by Alexander Calder, creator of the mobile. Opened in 1980, measuring 500 feet wide and 400 feet deep, the Madison Building is the largest library structure in the world (It encompasses 1.5 million square feet of space). The Madison Building is an unusual combination of a national shrine contained in a working building serving both as the Library of Congress' (LOC) third major structure and as this nation's official memorial to President James Madison. 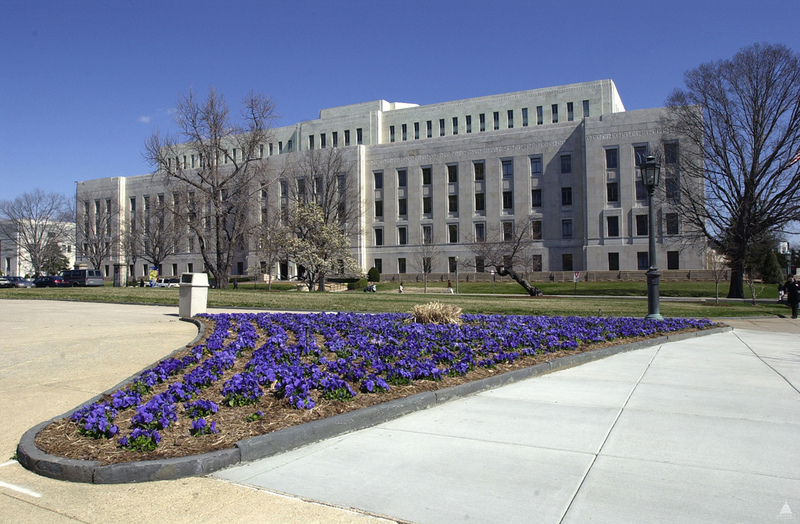 Full details on the James Madison Memorial Building and other LOC destinations are at aoc.gov/library-congress. The second building constructed for the Library of Congress (LOC) opened in 1939. For years it was known simply as "The Annex" before being named for President John Adams. Full details on the John Adams Building and other LOC destinations are at aoc.gov/library-congress. Completed in the spring of 1933, the Longworth House Office Building is the second of three office buildings constructed for the United States House of Representatives as well as a fine example of the Neo-Classical Revival style popular in the second quarter of the 20th century. Full details on the Longworth Building are at aoc.gov/house/longworth. The National Garden opened in 2006 as a place for visitors to experience the diversity of plants, including the rose, America's national flower. A natural complement to the Botanic Garden Conservatory, the National Garden is an outdoor laboratory for gardening in harmony with natural ecosystems. Full details on the National Garden and other USBG destinations are at usbg.gov. The Court of Neptune, the fountain at the front of the Thomas Jefferson Building of the Library of Congress, along First Street, S.E., adds a dramatic note to the building. Passersby enjoy the play of the jets of water on the majestic bearded and muscular king of the sea; his sons the tritons blowing conches; the frolicking, horseback-riding Nereids (sea nymphs); and the water-spouting turtles, frogs, and sea serpent, placed in front of a grotto-like wall. Full details on the Neptune Fountain and other destinations on Capitol Grounds are at aoc.gov/capitol-grounds. The Thomas P. O'Neill Jr. House Office Building was constructed in the early 1960s for use as Food and Drug Administration laboratories. It is one of the few federal buildings completed during the presidency of John F. Kennedy and the cornerstone bears his name as a result. Legislation transferred ownership of the facility from the General Services Administration to the U.S. House of Representatives in June 2017. Full details on the O'Neill Building are at aoc.gov/house/oneill. At the top of the Peace Monument, facing west, stand two classically robed female figures. Grief holds her covered face against the shoulder of History and weeps in mourning. Below Grief and History, another life-size classical female figure represents Victory, holding high a laurel wreath and carrying an oak branch, signifying strength. Below her are the infant Mars, the god of war, and the infant Neptune, god of the sea. The shaft of the monument is decorated with wreaths, ribbons and scallop shells. Full details on the Peace Monument and other destinations on Capitol Grounds are at aoc.gov/capitol-grounds. The Rayburn House Office Building, completed in early 1965, is the third of three office buildings constructed for the United States House of Representatives. Full details on the Rayburn Building are at aoc.gov/house/rayburn. The Robert A. Taft Memorial and Carillon consists of a Tennessee marble tower and a 10-foot bronze statue of Senator Taft. Above the statue is inscribed, "This Memorial to Robert A. Taft, presented by the people to the Congress of the United States, stands as a tribute to the honesty, indomitable courage, and high principles of free government symbolized by his life." The 27 bells in the upper part of the tower are among the finest in the world and were cast in the Paccard Bell Foundry in Annecy, France. Full details on the Robert A. Taft Memorial and Carillon and other destinations on Capitol Grounds are at aoc.gov/capitol-grounds. The Russell Senate Office Building (built 1903-1908) is the oldest of the Senate office buildings as well as a significant example of the Beaux Arts style of architecture. Between the U.S. Capitol and Union Station, located over the Senate underground garage, is the Senate Fountain. The fountain is a hexagonal granite monolith with high jets of water spouting from its center, surrounded by six smaller jets on a lower level. Lion-head spouts on the faces of the hexagon project streams of water into a large circular basin with a scalloped stone rim, over which the water spills into a larger oval basin. Full details on the Senate Fountain and other destinations on Capitol Grounds are at aoc.gov/capitol-grounds. The Summerhouse, a hexagon-shaped brick structure set into the sloping hillside of the West Front lawn on the Senate side of the U.S. Capitol Building, has offered rest and shelter to travelers for over a century. Full details on the Summerhouse and other destinations on Capitol Grounds are at aoc.gov/capitol-grounds. Finished and occupied in 1935, the Supreme Court building is a fitting home for the nation's third branch of government. Chief Justice William Howard Taft was behind the effort to provide the Court with its own building, moving out of the U.S. Capitol where it had been meeting since 1801. Full details on the Supreme Court are at aoc.gov/scotus. Until the Thomas Jefferson Building opened in 1897, the Library of Congress (LOC) was housed in the U.S. Capitol's west center building. When it opened in 1897, the new library was considered the most beautiful, educational and interesting building in Washington. Full details on the Thomas Jefferson Building and other LOC destinations are at aoc.gov/library-congress. The Thurgood Marshall Federal Judiciary Building houses agencies that support the work of the United States Federal Courts including the Administrative Office of the United States Courts, the Federal Judicial Center, and the United States Sentencing Commission. It was completed in 1992 and two years later named for Thurgood Marshall (1908-1993), the first African-American to sit on the U. S. Supreme Court. Full details on the Thurgood Marshall Building and other Supreme Court destinations are at aoc.gov/scotus. Full details on the U.S. Capitol Building are at aoc.gov/us-capitol-building. The United States Capitol is a monument, a working office building, and one of the most recognizable symbols of representative democracy in the world. Visitors are welcome to enter the building through the Capitol Visitor Center, located underground on the east side of the Capitol. The Capitol Visitor Center provides an increased focus on visitor comfort, safety and security resulting in a seamless, positive visitor experience at the U.S. Capitol. Full details on the Capitol Visitor Center are at visitthecapitol.gov. Beneath the East Front plaza of the U.S. Capitol. 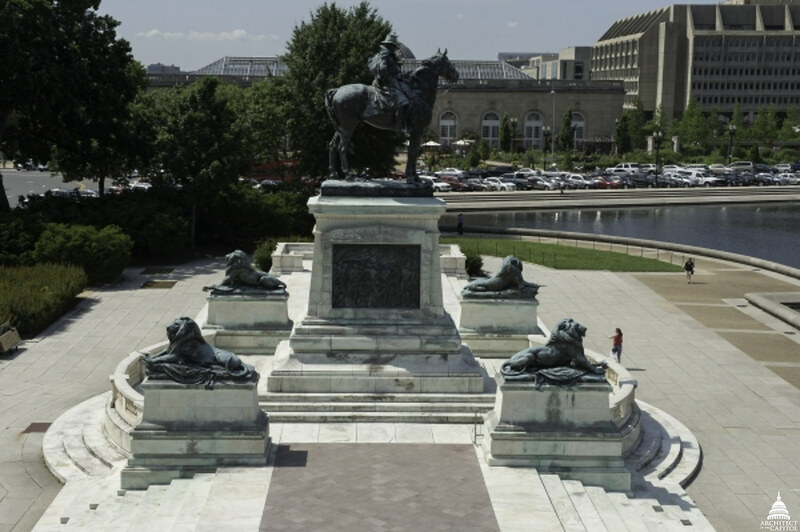 Situated in Union Square at the edge of the reflecting pool and backed by the United States Capitol, the bronze and marble General Ulysses S. Grant Memorial honors the Civil War Commander of the Union Armies who was also a two-term President (1869–1877). Celebrated as the largest equestrian monument in the United States, it is 252 feet long by 71 feet wide by 44 feet high and is a tour de force of monumental sculpture. Full details on the Ulysses S. Grant Memorial and other destinations on Capitol Grounds are at aoc.gov/capitol-grounds. The U.S. Botanic Garden (USBG) Conservatory is delightful to the senses and refreshing to the spirit. From jungle to desert to primeval paradise, the indoor gardens and galleries of the U.S. Botanic Garden highlight the diversity of plants worldwide, as well as their aesthetic, cultural, economic, therapeutic and ecological significance. Full details on the Conservatory and other USBG destinations are at usbg.gov.